Sassy Mom, 2 Spoiled Bratz & G.H. 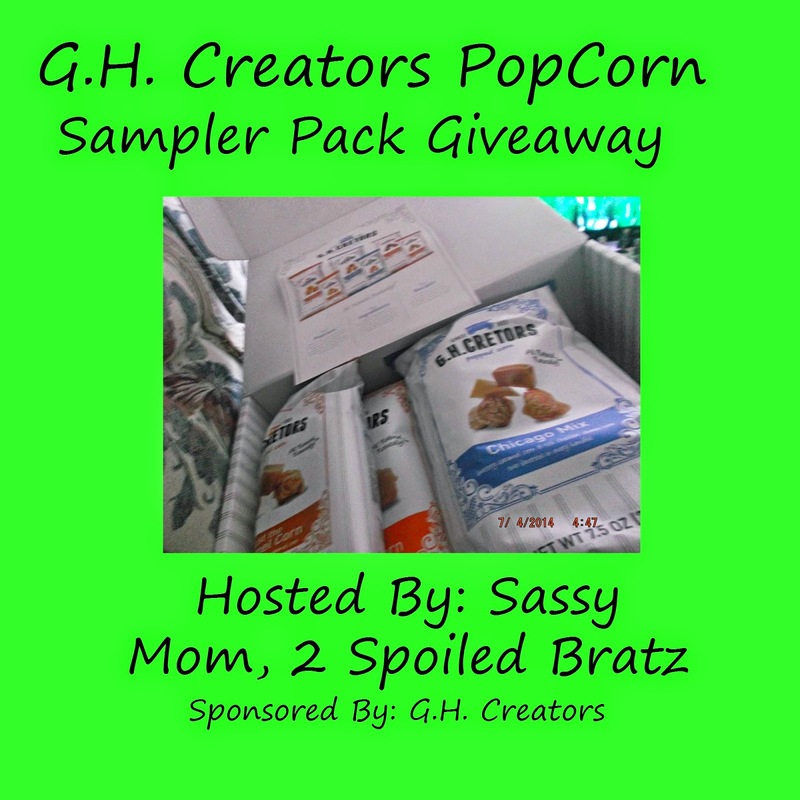 Creators are teaming up to bring you this awesome giveaway for G.H. Creators Just The Caramel Corn, Just The Cheese & Chicago Mix. The prize retails for $20! I love popcorn. I could eat it all the time. My favorite flavor is white cheddar. But, really, I'll eat any kind. Love Giveaways? Check out my current giveaways here! I eat popcorn all the time as an evening snack. Kettle korn is my favorite! I eat popcorn in the evening while watching TV and my favorite flavor is extra butter. I have 2 popcorn faves! I love plain with a little salt and fresh melted butter and I love it with butter and a sprinkle of parm cheese! Thanks for sharing and good luck to all! I usually eat popcorn when we are watching a movie, either at home or at the theater. I like just plain popcorn with butter and salt. I also like popcorn treats like Fiddle-Faddle or Cracker Jack too. I like popcorn for a snack between lunch and dinner, but I usually we eat it while watching movies on Friday nights. I like it with a lot of butter and salt! I like to eat popcorn almost exclusively at night, especially on my couch as I watch a good movie! Popcorn is a wonderful snack I usually enjoy in the evenings. My favorite flavor of popcorn is kettle corn! Hi! I eat popcorn as a snack in the evenings My favorite flavors are kettle corn, white cheddar, and caramel. Thanks!! i like them as late night snacks. my fave is kettle corn. Alice F. I think anytime is a good time to eat popcorn! I eat popcorn when I'm feeling hungry. My favorite flavor is cheddar.